Do you ever have that one polish color or finish that you absolutely can’t resist? For me, there’s just something inexplicable about gold holos. Even though I know deep down that they’re not all going to flatter my super pale skin tone (I’m looking at you, AEngland “Tristam’s Eyes”), I am always drawn to them in new collections. And now that holos with flakies are a thing, I’m in total polish heaven (I’m still trying to find backup of my beloved Jade “Irresistivel”). So when this beauty from Glitter Daze arrived on my doorstep, you can imagine my glee. 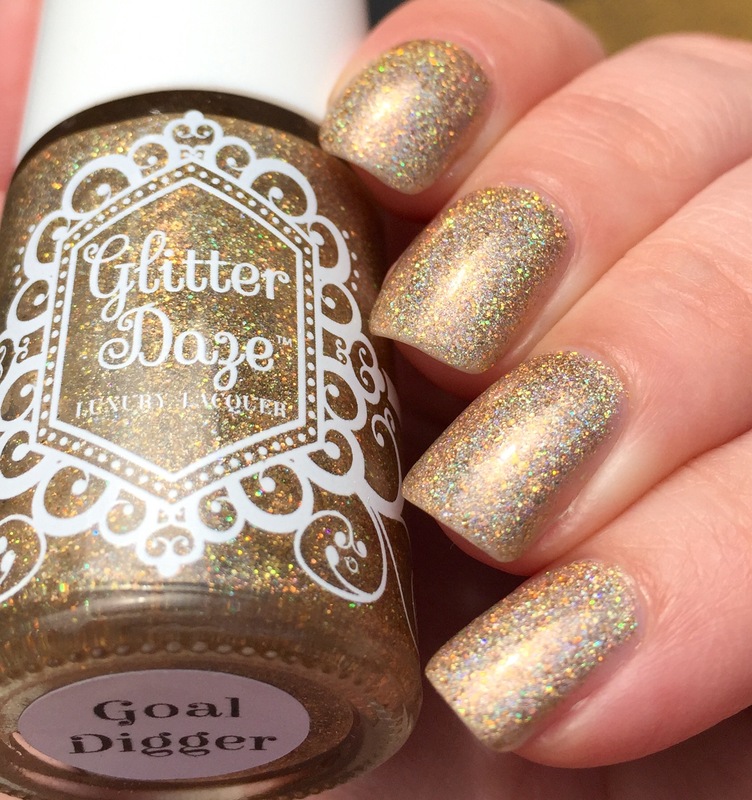 This is “Goal Digger,” a cool-tone gold holo with big silvery holo particles and gold microshimmer. Perfection. I won this gorgeous polish in a #NailGlossip giveaway, and I feel like I won the lottery. It is amazing. Thank you! The first coat went on a bit sheer and I was worried about coverage, but it built up nicely in the end. This is three thin coats and totally opaque. The formula is really nice and goes on smoothly. 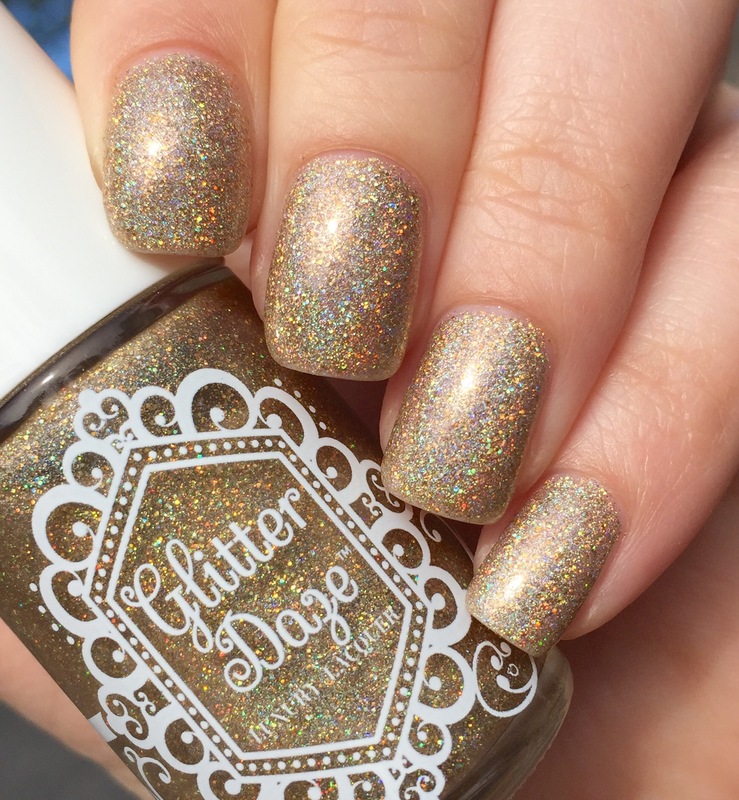 You can grab this polish on Glitter Daze’s website. This isn’t first from this brand, and I can’t wait to go try more colors! And, as a bonus, I am including a full-on sunshine picture, so you can see the holo on full blast. What a gorgeous gold! I love the one photo of it fully in the sun, it reminds me of glistening sand almost. So pretty! The last picture in sunlight is absolutely amazing! Gold holos are my kryptonite! 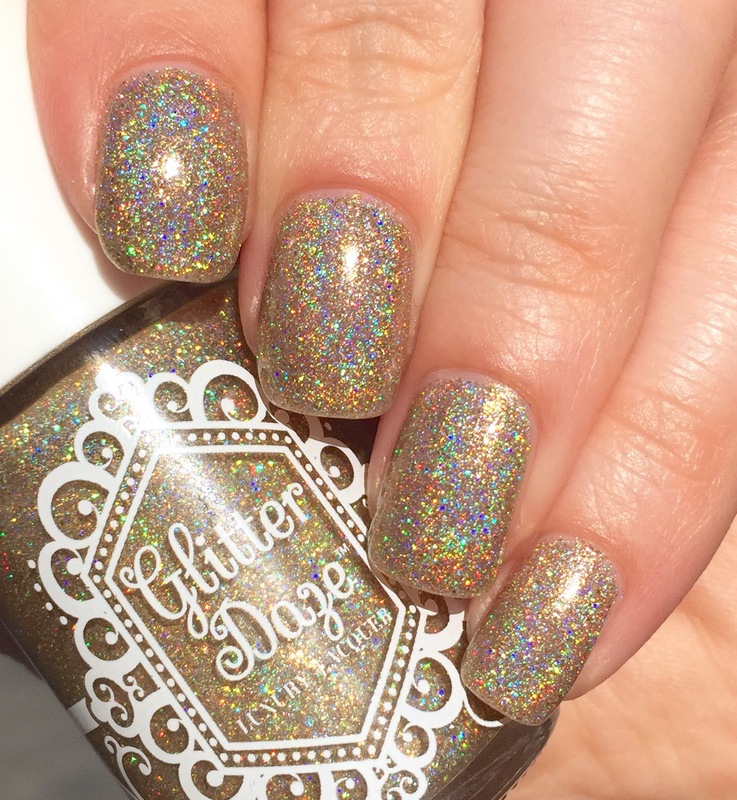 Wow, so beautiful, and I don’t normally like gold holos! This champagne gold is gorgeous! I love the micro glitter. Your pics captured the holo shift beautifully! This is just gorgeous. I’m not a fan of gold and I could see myself using it! I’m not a huge gold polish person, but this is amazing on you! Thank you! I am a total gold addict.